Here’s a sweet song by Seattlite, Bryan John Appleby, fittingly and creatively captured in this video by Christian Sorensen Hansen. Thanks to our Ballard-eer friends for passing along. Cool scene in Lake Washington near the Arboretum. We were prepared to be disappointed, but Peter and the boys acquitted themselves nicely on Leno last week. It might take seeing them live to sufficiently enliven the songs on their new “Burst Apart” album and help us move beyond the hallowed heights they achieved on their prior album, “Hospice.” Check out the band’s performance of Every Night My Teeth Are Falling Out below. The boy can indeed sing, and the song finds a groove. Last night on Conan, Gillian Welch and David Rawlings performed The Way it Goes off their new album, “The Harrow and the Harvest.” You can stream the entire album over at NPR. Check out the duo’s soulmate harmonies and Rawlings’ flawless guitar throughout. Amor de Dias (consisting of Alasdair MacLean, front man for The Clientele, and Lupe Núñez-Fernández of indie-pop duo Pipas) has just released its music video for its song, Wild Winter Trees, in support of their first album, “Street of the Love of Days” on Merge Records. In just 1:37 the video vividly conveys the song’s lyrics, with soft-focus on the family and familiar footing. And brothers and sisters. And time passing. When most think of the songs of T.Rex, they think of Bang a Gong (Get it On), Jeepster and many others. But for us, ever since it was released in 1973 on their stupendous album, “Tanx,” we always think first of Marc Bolan’s big-hearted ballad, Broken Hearted Blues. And then we hit repeat (in part because the song is too short). We will admit that we first heard this song on an 8-track in our cousin’s car (thanks to Mike Gridley for having great taste in the summer of 1973, four years before Marc Bolan’s car-crash death), and until very recently only owned it in vinyl. And his woman ran away without a smile. But the faces of the men are something else. Get good now, and face your face into the wind. We’re frankly not easily impressed by other music blogs since a lot of what’s done in the name of music-love is just re-hashed, cut-and-paste, shuck-and-jive (guilty as charged, your honor). So when we discovered Said the Gramophone a few years back, we immediately took notice of the calligraphic cant and caliber of the literate writing. The site’s writers bring new songs to your ears (oft-time legitimate newcomers that even we have not heard of–horrors! ), while providing vivid vignettes and imaginative (to say the least) allegories that at least tangentially relate to the proffered songs. What we also appreciate is that, like us, they refuse to go the way of advertising (though if Apple, let’s say, wanted to run a million dollar ad campaign on The Lefort Report, we’d consider kicking our ethics to the curb–but make it snappy would ya Jobs). What this backbone necessitates, however, is that once per year (this year from June 13th to July 12th), Said the Gramophone makes “The Big Ask” for donations to enable them to continue to provide their high-caliber content to you, us and the world. So go to their site at the embedded link provided above to read some of their fine writing and listen to a great song or two you have not heard, and then go HERE to donate to a quality site. We did. If you need further motivation to contribute, check out some of their writing excerpted below (found quickly and provided without song context; we’re sure you can find other entries at Said the Gramophone that exceed your needs and desires). “Teddy was 13 and under the impression that he was much more good-looking than he actually was. He wore his wing-tipped jeans like they didn’t fit like a rotten pear. He walked proudly with his chest sticking out in front, blissfully oblivious to his sinking hunched shoulders and his plunking, swishing gait. He spoke slowly, as if he poshly needed to taste all his syllables, taking no notice of his own condescending whine, nor the splay-toothed spittle that formed at the sides of his mouth. Despite having a voice like a seeping balloon, he enrolled himself in a local youth choir at the Briarcrest Community Center on Thursday nights. The Mountain Goats came all the way from Durham, North Carolina to Santa Barbara, and despite illness and the ill-conceived absences (without leave) of Santa Barbara’s music fans, the band took over Soho and took us to the musical mountaintop. But we were also deftly guided by voice (leader John Darnielle‘s) back to the realities of life at sea level (and some depths further below). 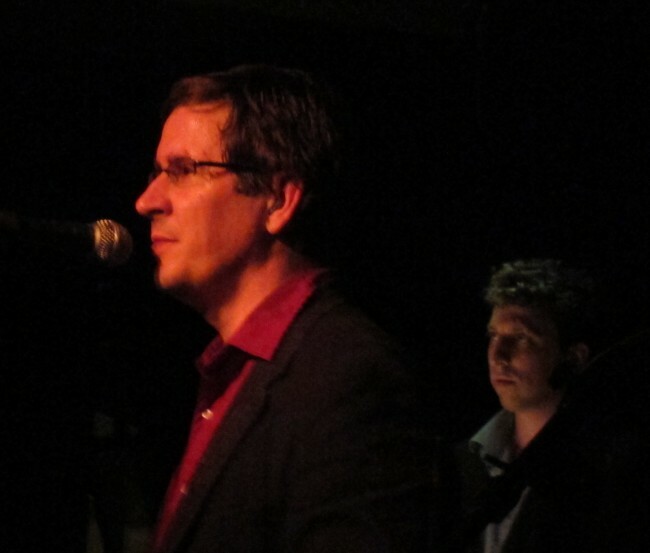 The Mountain Goats 0riginally consisted of only John Darnielle, but now have swelled to a whopping three “permanent members” including Peter Hughes on bass and Jon “Funny Man” Wurster on drums (with Yuval Semo added on tour on guitar and piquant piano). The band has had a cult following for quite some time, but its fan ranks have exponentially expanded since 2002 following album releases such as “Tallahassee,” “The Sunset Tree,” “Get Lonely,” and especially this year’s stellar “All Eternals Deck.” The Mountain Goats have long been universally lauded by rock critics, with the uber-prolific Darnielle (over 600 songs to date) being hailed as one of America’s best lyricists and songwriters. The New Yorker went so far as to call Darnielle “America’s best non-hip-hop lyricist.” We agree, but only if the “non-hip hop” qualifier is removed. In addition to being well-crafted, Darnielle never fails to hit a heartstring or twenty with his lyrics, which oft-times sing of good and bad family members (his abusive step-father falling into the latter category and finding his way into Darnielle’s songs). And any band Colbert loves is OK by us. Having never seen the band before, we were a little concerned when they came on at Soho last Friday and Darnielle let us know that he was sick with a fever. But Darnielle quickly allayed those concerns by slipping into his best “Show Must Go On” guise and giving a particularly strong reading of Liza Forever Minnelli, and continuing to gather momentum and strength thereafter. Liza Forever Minnelli was a great reminder that Darnielle actually grew up in San Luis Obispo and lived in and attended college in Claremont/Pomona before forming the band and eventually moving to Durham, North Carolina. In Liza, Darnielle laments his inability to divorce himself from his California upbringing and some of its trappings (“Never get away never get away I am never ever gonna get away from this place”). And as we have grown so sick of the hoary chestnut, we particularly love the line: “Anyone here mentions ‘Hotel California’ dies before the first line clears his lips.” Absolutely agreed. Throughout their set the Mountain Goats vacillated between feverish verve and slow, rending rounds of sound that were carried by Darnielle’s impassioned vocals and strident strumming on guitar (despite his fever), Jon Wurster’s drilling drumming, and Peter Hughes’ subtle bass and harmonies. Set highlights included San Bernardino, Southwood Plantation Road, Birth Of Serpents, Damn These Vampires, Up with Wolves and Boxcar (Jawbreaker cover). Also hard hitting were All Eternal Deck’s best song, Never Quite Free, and the band’s crowd-pleasing “anthems”, This Year and No Children. But the song that most took us aback was Matthew 25:21. Darnielle explained that this song described the last time he had been in Santa Barbara (having flown across country to visit his mother-in-law in her last, cancer-ridden days). Check out the lyrics and a performance of the song below (in the video Darnielle noticeably cracks at the word “cancer”). As he sang it at Soho, there was not a dry eye in the place (and particularly not in our 24″ x 24″ floor space). These are the places where heart and art rarely meet. We would also be remiss if we didn’t give a little “pep-talk” at this point to Central Coast music lovers. Look people, the Mountain Goats packed the Fillmore in San Francisco and the El Rey in LA just days before they played Santa Barbara. Where were you SB? You don’t want to get a reputation as a weak musical place packed with old people (and their parents) that don’t attend great concerts do you? Let’s go! Check out some other great examples of the band live below, and the Soho setlist way below. JOHN DARNIELLE | Autoclave — A Take Away Show from one shot seattle on Vimeo. Mountain Goats – Woke Up New (Directed by Rian Johnson) from rcjohnso on Vimeo. Opening for the Mountain Goats were Durham, North Carolina’s Midtown Dickens, who played with alternating composure and frenzied abandon, and whose energy and harmonies tickled the dickens (both the midtown, but also the upper eastside portions) out of us. Check ’em out below at Soho. For all you U2 junkies and for those that just came out of 30-year comas and haven’t heard of or seen the band, you can watch U2’s headlining set from last night at Glastonbury, starting with Part 1 below. This is a day-changer. For the better. Two of our favorite “Real Country” artists, John Prine and Iris Dement, collaborate and cavort in the performance below of Prine’s hilarious ode to monogamy, In Spite of Our Selves. Check it out. And the collaboration thankfully continues below. We have been mired in Warren-World for over a month and unable to scrape Warren Zevon‘s stunning 1976 major label debut album off of our turntable. A large reason for our repeat listening is needing to hear The French Inhaler over and over and over (a particular shortcoming of vinyl and turntables if you don’t have the 45 rpm single stylee). We humbly opine that The French Inhaler is one of the finest songs ever recorded. Lyrically the song is primarily a kiss-off to “Tule” Livingston (Zevon’s ex-wife and mother of his son Jordan), but also about life and lust in the LA music scene. 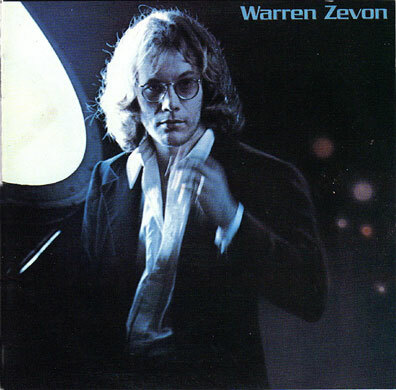 Evidently, after the breakup of Zevon and Tule, Warren found out that she was sleeping with another musician, and in the liner notes of the reissued album Jordan says that his mother confessed to him before she passed that the song was a “f*** you” to her for sleeping with this other musician.” At the conclusion of the song, Zevon also makes reference to the furor surrounding Norman Mailer’s exploitative Marilyn Monroe biography published in 1973. Musically, the song is a marvel featuring piano, complex chord changes, strings, and the perfect harmonies of Don Henley and Glenn Frey (a zenith moment they never again approached). We first hear those harmonies at the 1:00 mark, but thankfully they recur throughout the song. The album was produced by Zevon’s pal, Jackson Browne, with support from the best of L.A.’s session players at the time. One of our lasting musical memories is of catching Zevon at the Roxy in 1978 in support of his masterpiece, “Excitable Boy.” Zevon put on a manic show that night, but we all cringed when he repeatedly jumped up and collapsed to his knees (doing nothing in the process to undermine his mantra: I’ll sleep when I’m dead). It’s a wonder he survived another 25 years. Warren Zevon went to sleep permanently on September 7, 2003, aged 56, leaving behind one of the great discographies of all-time and capped off by this great song. Put it on repeat and marvel.